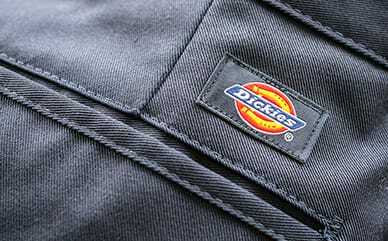 If you’re going to paint, dress the part with Dickies’ Premium Painter’s Pants. Made from an extremely durable polyester/cotton fabric, these pants will stand the test of time. The elite fabric also resists wrinkling, staining and shrinking, for premium quality that can’t be beat. The extra-strong, triple-stitched seams provide distinct durability so you’ll remain worry free as you stretch, bend and move throughout your day. Talk about utility—these painter’s pants include two hammer/tool loops, a deep rule pocket on the right leg, a double tool-and-cell pocket on the left leg and double back pockets for all your supplies.